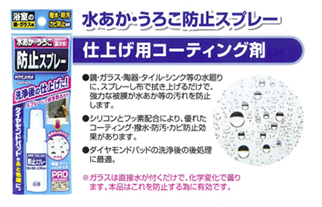 Diamond Pad | KOYO INDUSTRIES CO., LTD.
. Use artificial diamond by technical patent. It can be cleaned out specially strong dirt that usually it could not cleaned out by using detergent or commercial grinding materials for the mirror/glasses in bath room.
. 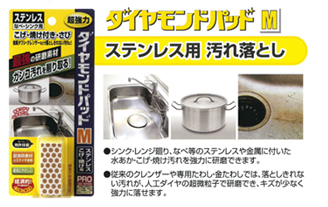 This product made smaller for general use from expensive professional-use product.
. Scratch resistant type is top shear in Japan as this product has top sales and best selection from Pro & General use market and And this type has highest performance in the lineup.Eco-friendly, no need any detergent or solvent. It can be useful until this panel wear out. · Just dirt can be wear out by the cushion effect of the grind face without any scratches on the glass part. · Before start the work, water on the surface of glass, mirror to avoid from any scratches. · Rob on the glass by this product with water. A little by little rob by the parallel to long sponge surface. · First you may feel the rough on the surface but finally dirt is clean out when you don’t feel any rough on the surface. · The Glass has the durability from the acid excepting fluorine hydrogen, or phosphoric acid. · But Alkaline is easy to corrode the glass/mirror and the glass or mirror will be weathered and corroded in much short time according to the environmental conditions. · On the surface of the glass: Sodium ion and Hydrogen ion are exchanged, and them it become Sodium Hydroxide (Alkaline). · Sodium Hydroxide eats on the surface of the glass, and the glass will be crowded whitely. · And metal oxide by the calcium in the water and inorganic salt made from the stone, concrete, and stone, these are attached on the surface on the glass and mirror chemically. · These things are many reason is why glass in the train car and window glass has scale dirt. · And the part that has weathered layer and scaled corroded cannot be cleaned out by normal cleaning [any cleanser type or usual grinding materials]. · It is not for coated/film-coated, painted surface, ground glass, etched glass, lens of eyewear, resin glass, water repellent glass. [And also glass or window in the car. Possible but cleaning professor only]. Please make sure with the manufacturer before you try special processed glasses. · Take care and test first on the small area as the artificial diamond is included in the products No need to push strongly when you use this product. · For scale/stain dirt on the potter’s ware & tile. And for roundly stain and urolith in the lavatory pan. It can be cleaning such the tough dirt out. · High reputation in the professional. · Scratch resistant, difficult to happen the scratch by using normal water proof paper and it can be also prevent from the dirt reattached. · More powerful grinding than “DIAMOND PAD S”, this type is nearly like filing the dirt off. · Dirt on the stainless alloy or other metal part. · For the difficult come off the dirt by scrub brush, metal sponge, wire wool or usual cleanser. · S2 Size is double grinding area as much as S type. · S2 is increasing the work efficiency and durability. · Actually, this red pad has top shear in the market for professional glass grinding. 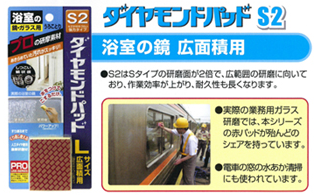 · The train company uses this pad for scale dirt on the mirror of the car. · Coating Spray for finishing after cleaning. · It can be made the durable coating after spray and wipe the surface of mirror, glass, potter’s ware, tile, sink and relating the kitchen work. · Silicone and Fluorine in this spray can prevent from water, contamination and mildew/mold proof. · This one is the best effort after use diamond pad. · This product is the best for prevent from misting glass up.